Last year, before E3, and back when Dambuster Studios was still called Crytek Nottingham and hadn’t been sold to Deep Silver, I saw a presentation of Homefront: The Revolution in action. I thought it looked fantastic, like an open-world version of Half-Life 2’s City 17. 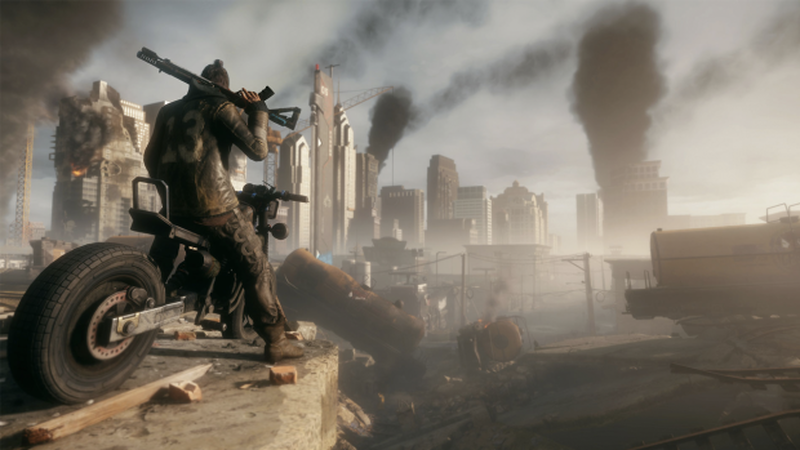 At this year’s Gamescom I got to sit down and play Homefront for 30 minutes and, while I still want to see more, what I played didn’t deliver on my expectations set by the pre-E3 presentation. Set in an alternate timeline where Korea and other Asian nations form a federation before invading the US, Homefront places you in the shoes of a fighter in the Philadelphia resistance. The fight for Philadelphia has left the city carved up into districts. The green zones at the centre of the city are where the KPA is at its strongest, they’re also where the invaders are at their most comfortable: they have running water, a stable power supply, and their fortifications make green zones one of the safest places in the city. Yellow zone districts are where the bulk of the Americans live. The cluttered city streets are awash with patrols, scanner drones, and ever-watching cameras. If you don’t walk with your weapons holstered then you’ll be overwhelmed by guards in short notice. Power and water are intermittent and overpopulation has forced people into slum-like tent cities. The pre-E3 demo was set in a yellow zone district. The red zone districts are where the resistance is at its strongest. While the KPA presence is still heavy, you’ll run into resistance troops, weapon caches, and traps set up to take out enemy patrols. The landscape is barren, though. Heavy shelling and frequent street battles have left most the buildings in rubble and there’s a constant haze of brick dust. My hands-on was set in a red zone district. Compared to the yellow zone’s marriage between looming tower blocks, surveillance technology, and colourful resistance propaganda scrawled across the walls, the red zone’s brown rubble is disappointing. In the yellow zones you’ve civilians just trying to get through their days without getting caught up in a fight between the occupiers and the resistance. Whereas in the red zone its just two sets of troops locked in constant pockets of street battles. Last year’s look at the yellow zones is why I’m holding out hope Homefront will be more than an average open-world shooter. The demo I played kicked off with a short scripted sequence where I took out a KPA patrol with the help of other resistance fighters. A small group of soldiers backed by an APC fitted with a heavy machine gun was slowly making its way up a rubble-strewn street towards the ruined building where we were holed up. Rather than assault the patrol head on I joined another fighter and flanked the patrol by climbing across the roofs of buildings down one side of the street. A roof mid way down the block housed a trap that, activated with a tap of the ‘X’ button, would roll fuel barrels down on the street below. Timing it just so, I rained these barrels down on the APC and the squad, blowing up the vehicle and taking out a few of the soldiers. Immediately the street became alive with gunfire. The KPA soldiers sought out cover amid the black smoke from the fire, resistance troops from three sides of the streets fired down on the troops. A pair of drones swooped in low, their flashlights cutting through the smoke haze to look for resistance troops. If these drones are left flying they will call in reinforcements whenever you get into a gun battle. I ran below the drones and shot them at close range in the belly with my shotgun. Their chassises clattering to the ground behind me. My goal, now the patrol was clear, was to head to a Strike Point in the north of the district and capture a KPA building. These Strike Points are much like Far Cry’s enemy camps and watchtowers. They dot each district and, when captured, reveal points of interest in their local area. Capturing them also makes resistance fighters take up guard posts and bring in weapon crates for you to raid. I could walk directly through the centre of the district but the route would have taken me past a lot of patrols and, now, I’d have to take them on alone. The AI resistance had disappeared. Instead, I found, stashed away in a shipping container, a dirt bike that I could use to take a less direct but faster route north. The red districts have been in the hands of the resistance for a long time so the areas are shot through with tools to help you, like the barrel trap. There are also ramps built from corrugated iron that open up routes you can ride through on the light motorbike. Setting off from my position in the south I raced through the rubble, taking jumps that sent me through narrow corridors in first floor buildings, between shipping containers, and down into trenches dug into the streets. I didn’t travel unseen but whenever I was spotted I could escape the KPA much faster than they could follow on foot. I was able to find a back way into the Strike Point building that meant I didn’t need to fire a shot before reaching the control panel. I hacked it with my in-game smartphone and was soon joined by resistance fighters. For the next 20 minutes of my hands-on I explored the area, tried to capture other Strike Points, and hunted KPA soldiers. Dambuster has kitted you out with tools to get experimental when it comes to killing people. You can easily craft explosives and attach them to a delivery device of your choosing. I took my Molotov cocktail and strapped it to the back of a remote control car before driving it into a group of soldiers. I could have thrown it, made it into a proximity mine, or rigged it to blow with a quick call from my phone. Your guns are easily rebuilt, too. Like in the Crysis games, you can bring up your gun and swap out its parts to modify it for whatever purpose you might have. My assault rifle could have iron sights, a red-dot, or a long range ACOG scope. I could fit it with a silencer, change the magazine, and give it a forward grip. There’s a lot in this sandbox to play with. The reason the demo left me disappointed is that it showed the game at its most simplistic. Two factions fighting over a brown wasteland. Weighed on its combat alone, the weapons currently lack punch and the enemies aren’t engaging to fight. The most clear comparison I can think of is the Combine in Half-Life 2. Both the Combine and the KPA are futuristic, military occupation forces where the soldiers wear dehumanising body armour and full face helmets. Yet, and this is only from 30 minutes with Homefront, the KPA didn’t seem to engage with the environment as convincingly as the Combine did. The Combine would split into teams and search through buildings room by room to find you. The KPA, when under fire, would fall into cover and then pop out to take shots at you. I didn’t feel I had to keep on the move to outmanoeuvre the KPA. However, there’s still a lot to see from Homefront and this was only my first time with the game. I really want to see how much Dambuster will embrace the complexity of an occupation. The developers have told me that they aren’t touching things like suicide bombers but that collaborators and traitors will play a key part in the story. I want to see how fighting in areas filled with civilians will affect the way you play. The red zone was devoid of these complexities, however. I want to see what it’s like to play in the yellow zones, I want to play one of the story missions that sees me making an assault on the green zone, and I want to see what further tweaking of the gun handling and AI will do to make me feel underfoot in this dystopian future.